A rest stop on 95, alongside the Pahranagat National Wildlife Reserve. I made it to Quartzsite, Arizona from Wendover, Utah. The photo above is what was missing from an earlier post about Pahranagat, but I figured it was worth posting now since most roadside rest stops are flat, denuded affairs that have no charm. This one has very usable picnic tables, shade trees, decent views, and a break from winds. Wendover to Parker was originally scheduled to be four short days of driving, but the first day had to be doubled because of the combination of high altitude and a cold front about to move into it. It was a good thing that the Pahranagat rest stop was available then, because sunset was approaching and Pahranagat’s Upper Lake camping area was chock full. This compound is very nice, but its designated sites are very limited in number with specific vehicle types in mind, and the now-55′ Defiant could wedge into only one or possibly two of the choices anyway. Those with much less majestic rigs will fair better but, given Pahranagat’s popularity, I’m told it’s best to arrive before 4 PM to avoid disappointment. I suggest 3 PM if staying there is important to you. A 14-day facility, I would imagine that openings can be a bit of a challenge to find. Traffic on the long, slow trail to get there was surprisingly heavy, given the 11 or so campsite limit. Was everyone trying to get to nearby one-horse Alamo, Nevada for Schnapps und beer before happy hour? The single grocery store/truck stop there did have everything but perishables like berries of any kind, or pears. But to compensate, they did have a rack hanging with six-gun leather holsters selling for $49.99, complete with lots of cartridge loops. Intended no doubt for a generic Old West-style revolver, they were gaudily stained, and I wouldn’t wear one over valuable clothing for awhile. Great for Halloween, though. I should have taken a picture, but it naturally didn’t occur to me that there has been quite a bit of change in cellular phones since the days of the brick. I’d forgotten that they now have lenses and shutters, too. The trade-off being, of course, that modern cellphones are no longer excel as defensive weapons. A large, flat campground/parking area off Shea Road in Parker. Parker, Arizona was attained by doubling up on drive time again. It was easily done, and motivated by the fact that I did not like the planned stopover that I had selected, once I got there and took a look. Parker is an interesting town, with all of the basics that most folks would want, except perhaps for decent dining. If you consider franchise burger or pizza shacks, pricey sports bars or hole-in-the-wall carryouts to be decent dining, you’ll have many options here. They had a really good Chinese restaurant, but it burned down earlier this year. I settled for Lily’s Mexican Food while I waited for repairs on the Ford to be completed. It’s technically a carryout place too, but has plenty of tables and chairs available in a generous space. You go to the counter to order, and they bring it out to where you are seated. Exceptionally clean and bright in aura, you’ll find no smudges on the glass table tops. The fare is well-prepared, and I would not hesitate to return there. Cuisine, it’s not. Good, competent, and satisfying, it is. The restaurant is named and themed after the owner’s daughter, who passed away in her late teens. It is a family business, and makes Taco Bell’s whole schtick look like the corporate version of a confidence game called Fake & Fleece. No feeling like you’re at the end of an assembly line here, wondering how many mornings the components have been reheated. The same mountain that blocks the cellular signal to this patch also provides some visual interest. The place I camped off of Shea Road is very large and, I suspect, is an occasional parking area for off-road racers and spectators. The Parker 400 off-road event originated here decades ago, and soon had a stout entry list of participants. This course is a fine way to pound the crap out of your equipment, and the Did Not Finish ratio is high. But as with all things having the potential for commercial exploitation, the big sponsorship, big purse, and big names took over and discouraged away the little guys that had formed the bulk of entrants. The event has been held under many names now, under various organizers and sponsors, each hoping for the return of the grassroots glory, less the grassroots headaches. What guise it’s under today and how high entrant levels are, is unknown to me. 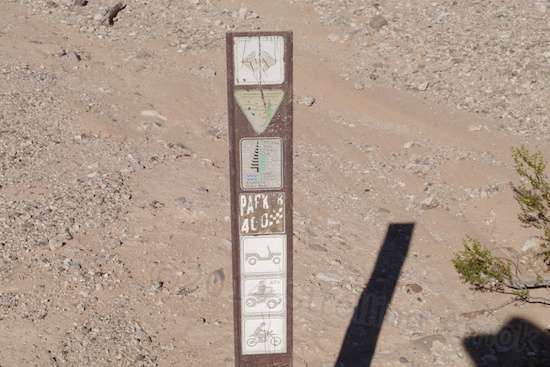 A trail marked for the original Parker 400 off-road race. One might lament wilderness being used for motor vehicle use, which tears the land up. I’ve seen several instances of how a single, seldom-used track can cause a surprising amount of erosion damage, and quickly. 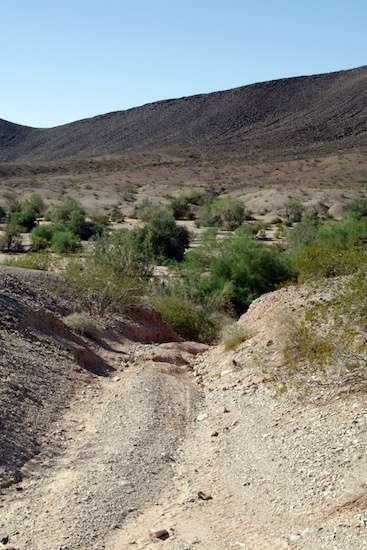 However, each of the so-called designated OHV areas I’ve seen are the best possible places for this type of use. I wouldn’t go so far as to call them wastelands, but they are as close as it gets. Much of this area is set aside for ATV, Jeep, and dirt bike use. It took longer than expected to leave Parker, since the Ford dealership was caught between digital versus print part number discrepancies, and the single trailer brake module having been updated to a module plus separate sensors for either gas or diesel power. It was a three-day fiasco, but despite the part number issues, it was hard to be upset: the unfortunate young service guy was pretty straightforward, I wasn’t exactly in a high-pressure rush since my boondocking site was nice, they had a very large, exceedingly comfy and unpopulated waiting room with true broadband WiFi, a big flat panel TV with the controller handy on the coffee table, soda vend at 50 cents a can, coffee, and when the TV is off, as quiet as Pharoah’s tomb. The Defiant is good, but in comparison for pure comfort and bandwidth, I’d rather lol about in Parker Ford’s waiting room. They started selling Model Ts in 1916, so they’ve been at it awhile. Naturally, the end result is a bit of a jumble after 98 years of taking over and adapting half of the block to various parts of the operation. The current “showroom” currently holds a small Lincoln, and they could wedge in maybe another two, if they got rid of the waiting area. 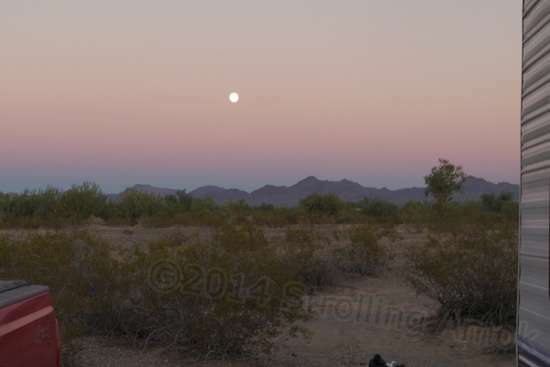 The moonrise over Quartzsite, a familiar sight. 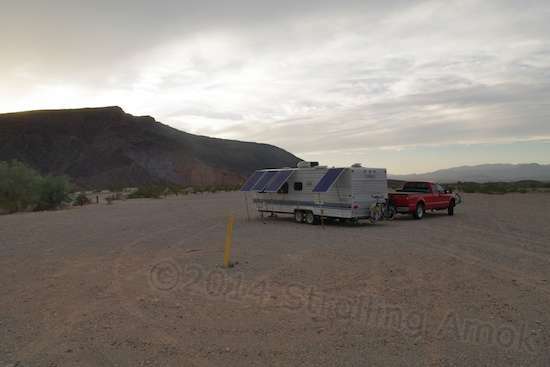 The short jaunt to Quartzsite ended in acquiring a seasonal LTVA camping permit before taking the Defiant over to RV Lifestyles for a look-see at its blown rooftop A/C unit that had expired in Sandwich, Illinois during the onset of a rather moist heat wave. The repair desk guy told me that units that blew out in the manner that mine did usually had a blown compressor, a problem that justified replacing the whole thing instead. Not good. But I dodged a bullet here, only needing a new electronic control box, and getting out the door for well under $200. Along the way, they also tested the trailer’s main electrical controller and let me know that its house battery recharging section was pumping out 16 volts, which probably explains the batteries’ high water loss rate when sitting in a commercial camp with AC power electrical hookups. Water usage while on solar is close to zilch. Their recommendation was to keep some DC device turned on when on hookup power, to try to knock the voltage down a bit. That may be a trick, since my conversion to LED lights greatly reduces power loads, and there isn’t much I have other than a Samlex inverter, that is completely imperious to 16 volts. For the time being, they located the circuit breaker for it and turned the charging section off. I may leave it off. The house pack is recharged by the truck during travel, and I tend to deploy solar for long stays even when on hookups in Illinois. Why bother using solar in a commercial camp? AC power there is expensive, and is an added charge to the basic monthly rate. I’ve run the A/C only a few days in a month and paid $60, so more hot days and tacking on additional devices can really add up. The air conditioner requires AC power, and so does the microwave that I never use, but everything else can be on solar. Secondly, the stowed solar panels partially clog access to the front office in the trailer, and need to be out of there anyway. Storing them last summer cost $30 a month. May as well use them. Lastly, I believe that the expensive AGM cells are happier in modest use and recharge than they are just sitting for two or three months. I’ve spent two summers swapping a plug-in AC charger from pack to pack, but I just don’t get much of a buzz from this approach. And speaking of solar panels, an LTVA ranger stopped by to warn that some yahoos have been doing a smash and grab of sorts, stealing solar panels that are ground-based and easy to get at. These are mainly the compact portable setups, and the campers affected have been beside the main trail in the main cluster of campers, where it’s easy for the thieves to get away with a minimum of exposure. Most campers here also leave for town frequently in their vehicles, broadcasting the odds that their site is uninhabited. The Defiant’s panels are obviously easy to get at, though large and heavy enough to potentially cancel out their black market value in the offsetting cost of a hernia operation. I may have to consider adding some means of delaying inconvenience to their removal, but thanks to my intrinsic laziness, love of procrastination, and the Evelo e-bike, the Mighty Furd rarely leaves camp. I’m also in a dead end, though too close to the road for my liking. The basic issue itself is sad, in that it surfaces wherever people congregate. Out in Wendover, I seldom had a neighbor, and when I did, he was half a mile away. I was far enough away from a working trail that passersby had to commit for any scouting run, because my campsite was not on the way to anywhere else. If there’s a risk in places like that, it’s for the miscreant. I can tell you, find an old coot in an old, run down trailer, and the odds are, he isn’t likely to be the type to call 911 if there’s a relational issue developing. People do that in town. Out here, problems are more likely to be resolved among the attendees. Standard behavior in approaching a lone trailer in the boonies – and this applies to anyone – is not to approach it. If it must be approached, make noise early and announce yourself at a distance, moving forward only after the resident is plainly aware of your presence. Just marching up and hammering on the door is not, not a good idea. Vicious, ill-trained dogs are one issue, firearms and the element of surprise are one, drugs are one, and the mental state of the resident is the last. Surprise is generally bad. When people ask about feeling unsafe out in the boonies, miles from anywhere or anyone, I have to say that the sensation is just the opposite. Camped truly alone, there is no way for an approaching vehicle to not be noticed. There is little need to paranoically lock everything up as one would in the suburbs. 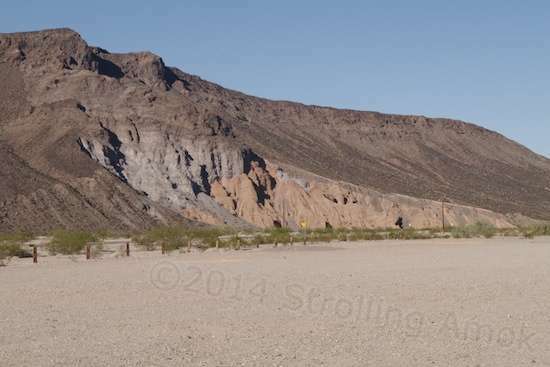 It’s the crowding in places like Quartzsite that pose the threat. Lots of equipment left out, lots of people around, and many more disaffected locals motivated to take advantage of the socially-inclined campers who feel that there are too many other campers around for anyone to lift their stuff without being seen. Safety in numbers. But it doesn’t actually work out that way. 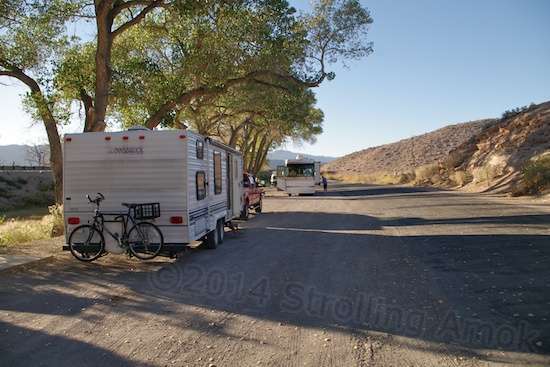 Here, it’s best to pick a fairly isolated campsite that requires commitment to visit, and stay out of the mob of RVs close to town and the handy escape routes. The clue? Here, rangers march right up and exercise their authority. Odds are good that they are visiting wealthy Canadians, who are polite and sociable. In the wilds, they follow the proper Approach Procedure. Thieves and grifters likewise go to areas where opportunity is maximized and risk is low. They are less eager to confront isolated camps where they are more likely to encounter an armed hermit, and where the soil is so easily shoveled. Glad you’re back online! I always look forward to your thoughtful posts. Thank you, Rod. Sometimes the necessities of life put a dent in my writing time. “Where the soil is so easily shoveled” is a good line but it sure doesn’t match my experience of Quartzsite. The only places easy to shovel are in the washes then you risk rushing water exposing something you’d rather it didn’t. And I’m not offering to tell. Only dangerous situation I ever encountered was just after giving a young couple in a van a jump start out in Colorado. After they got their van started the young guy asked “You out here all by yourself, John?” His interest was transparent and I uncharacteristically thought fast and told him “No, three other RV’s I’m caravaning with should be along in ten or fifteen minutes.” The couple drove off. I guess no good deed really DOES go unpunished. Oh, that sounds creepy enough, JM. Also sounds like a key psychopathic trait: view kindness as a weakness to be exploited. I wish they always had big signs over their heads, because to help one is to potentially set oneself up as the next victim, in one manner or another. Thanks for mentioning your experience.